Whether you have been in business six months or six years, you need to market your services in order to survive. Never stop thinking about how you can enhance your sales; marketing your wide format printing services should be Step 1. Here we take a look at three top tips—from big and bold to social and engaging—for marketing your wide format printing business. You create beautiful graphics on large scales for everyone else in town, why not yourself? You probably already have a delivery vehicle for your company or at least a car for your sales team—use it! Wrapping a store vehicle with your logo and example of your wide format services works like a moving billboard people will notice all over town. 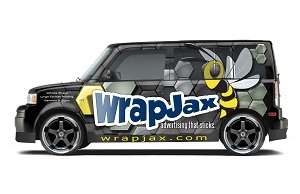 Instead of telling business customers how vehicle wraps and advertising on a large-scale work, now you can show them. Whilst wrapping a vehicle may cost your business up front, the potential for turning a profit is unlimited. The more a wrapped vehicle is on the road, the more people will see it and the more businesses will seek out your services. Be prepared for your phone to start ringing. Wouldn’t it be great if you could advertise your business in a room full of business owners and advertising managers? If you are nodding your head yes, you should be checking out non-graphics tradeshows in your area. Consider taking a printer to the show so you can show off what you are capable of right then and there. Attendees will be drawn to your booth and will be leaving with your information in hand. A tradeshow will also be an upfront cost for your print business, but the return on investment can be very rewarding. Just be sure to communicate why these business owners should be doing business with your company. If you haven’t already, consider showcasing your print services online using platforms like Facebook, Pinterest and Instagram. These channels give you a chance to create a visual display of your work where business owners can become more than customers—they can become your fans. Whilst you can sign up for these social accounts with no upfront costs, remember you will need to invest employee time into keeping them up to standard. Check back next time as we discuss tips for growing your business through online platforms. In the meantime, learn how to boost your bottom line with wide format printing. Discover nine tips in this free download today.